Extremism has become a major issue in campaigning for Belgium’s local elections this Sunday, notably in the country’s Dutch speaking region. Extremism of various kinds are in the mix. After right-wing parties were accused of selecting candidates with far-right sympathies, they started hunting for hidden Islamists and Turkish ultra-nationalists in more left-wing parties, with a certain degree of success. 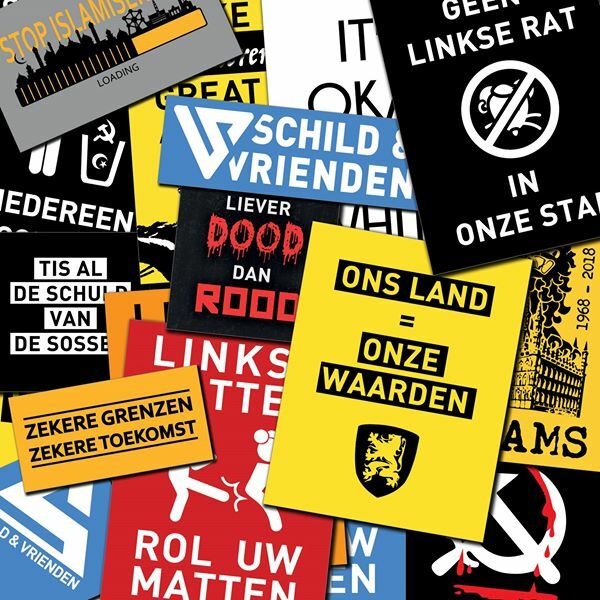 It started with a documentary by the Dutch language public broadcaster VRT early last month, when a movement of young Flemish nationalists which had been considered harmless was exposed as a truly dangerous group. The movement’s name is ‘Schild en Vrienden’, or ‘Shield and Friends’. This is a reference to the battle cry of Flemish fighters during a clash with the French – seen as oppressors – more than 700 years ago. Schild en Vrienden’s most worrying strategy, it soon became clear, was to infiltrate other organizations, with a particular focus on more moderate right-wing groups. The N-VA party, for instance, currently in government, was to be “pushed further to the right from within”. To that end, several Schild en Vrienden members volunteered as N-VA candidates for the upcoming local elections. Investigating Milli Görüs’ presence in Belgium, I found out that it too has members on Flemish electoral lists. In Mol, in the province of Antwerp, the secretary of the local Milli Görüs group is a candidate for the centrist party CD&V. In Temse, in the province of East Flanders, the local Milli Görüs president is taking part in the local elections for the center-right party Open Vld. And in Heusden-Zolder, in the province of Limburg, the center-left party sp.a has a candidate who clearly shows his sympathy for Milli Görüs on social media. This candidate also ‘liked’ more extremist currents on Facebook, such as the Turkish Islamist preachers Nureddin Yildiz and Metin Balkanlioglu, the Canadian Salafist Bilal Philips, and the Indian Salafist Zakir Naik. When we published our findings in Het Laatste Nieuws, Belgium’s largest daily newspaper, we explicitly refrained from judging whether these developments are problematic, citing the wide range in the degrees of radicalism among Milli Görüs’s followers. Furthermore, none of the candidates’ parties were overly concerned in their reactions. Fascinated by the ease with which different radicals can infiltrate moderate parties, we decided to investigate the far-right party Vlaams Belang too. Quite logically, it is much more tolerant towards groups such as Schild en Vrienden. But under the rule of its current leader Tom Van Grieken, who is aiming to revive his party after it lost many of its voters to N-VA, explicit sympathy for neo-Nazism and antisemitism was banned. Examining their Facebook accounts, we found that at least fifteen candidates are still close to neo-Nazism. Five of them ‘liked’ Facebook pages glorifying Adolf Hitler and/or posted Nazi symbols, while ten others showed support for the far-right terrorist Tomas Boutens. He was a Belgian army soldier with a past record in the neo-Nazi group ‘Blood and Honor’ when he was arrested in 2006 as the suspected leader of a terrorist organization. Bouten’s group, called ‘Bloed, Bodem, Eer en Trouw’ (BBET), combining the national-socialist creed ‘Blut und Boden’ with the SS motto ‘Meine Ehre heisst Treue’, had assembled explosives and weapons for violent attacks. The image was publicly visible on the Facebook page of a Vlaams Belang candidate for Sunday’s local elections. It shows a Nazi flag and the ‘Odal rune’ that is legally banned in Germany for its association with Nazism. Confronted with these revelations, Vlaams Belang announced an internal investigation, which could lead to the expulsion of the fifteen candidates. Removing them from the electoral lists was no longer possible, however, because those lists were already legally registered. While confirming that neo-Nazism cannot be accepted, the party also complained about a “witch hunt” against its candidates. In addition, it was telling that one of the fifteen immediately received support from Constant Kusters, an openly neo-Nazi politician from the Netherlands. In several cases, the evidence was rather poor. Showing the leader of a local Grey Wolves association guided through a refugee center by a politician of Turkish descent isn’t telling us anything about a hidden affiliation of the politician. And posting a quote about the Palestinians from the leader of the Milliyetçi Hareket Partisi, the Grey Wolves’ political party in Turkey, amidst many other opinions, isn’t a sufficient pattern for calling the poster a Grey Wolf himself. At first sight, another allegation that a candidate for the left-wing environmentalist party Groen in the East Flanders town of Aalst supports the Grey Wolves seemed poorly documented. But a further investigation by Het Laatste Nieuws revealed that the only two likes on the candidate’s Turkish Facebook account go to pages that heavily promote Turanism, the pan-Turkish ideology known as a pillar of the Grey Wolves. Groen has not acted against its candidate yet, but it has said it would confront him with the facts. In the most convincing case, a female candidate for the centrist CD&V in Lokeren in the province of East Flanders was pictured with the Grey Wolves flag – showing three white crescents on a red background – and making the typical Grey Wolves salute, where the little finger and the index finger are raised, so that the hand looks like the head of a wolf. It is noteworthy that the recent picture was found on a Turkish Facebook account. In line with the previous case, the candidate had one account in Dutch – used to campaign for the Belgian elections and lacking clear signs of an affiliation with a Turkish political movement – and one in Turkish, on which she liked over one hundred ultra-nationalist Turkish pages and accounts. It is arguably a bit ironic to see Belgian right-wing parties eagerly expose Grey Wolves on more centrist or leftist electoral lists these days. The ideology of the Turkish nationalists comes close to their own – especially that of Vlaams Belang – and one could say that they should be glad that people with right-wing views are quietly entering the left. To conclude, Belgian voters have learned that they can choose from a myriad of extremisms on regular election lists. They can vote for a near-Nazi within the moderate right-wing, a Turkish ultra-nationalist on a Christian Democrat list, a Turkish Islamist among the Social Democrats, and a genuine Hitler supporter among far-right politicians who claim to shun Nazis. All the criticism about witch hunts put to one side, it is probably better for voters to know all these things, and a good idea to look for similar patterns in other countries as well. The opinions expressed in this article are those of the author and they do not necessarily reflect the views of European Eye on Radicalization. Schild & Vrienden Facebook page: [https://www.facebook.com/schildenvrienden/posts/keer-op-keer-werden-de-lezingen-van-staatssecretaris-theo-francken-gesaboteerd-d/1402365633218505/]. Guy Van Vlierden, The French Anti-Muslim Terrorist Cell – A Mirror Image of Jihadists, European Eye on Radicalization, June 28, 2018. Vijftien huiszoekingen in gerechtelijk onderzoek naar Schild & Vrienden, HLN, September 19, 2018. Spraakmakende reportage toont dubbele gelaat van ‘Schild & Vrienden’: rechtse jongerenbeweging heeft geheime, racistische agenda, HLN, September 5, 2018. The same happened with one candidate from the centrist Christian-democratic party CD&V. The far-right Vlaams Belang didn’t bother about Schild en Vrienden members among its candidates, and two suspected followers were allowed to remain on the electoral lists of N-VA and the centre-right liberal party Open Vld. Zuhal Demir (N-VA) verzet zich tegen islamschool in Genk en vraagt Staatsveiligheid de organisatie te onderzoeken, HLN, September 18, 2018. Milli Görüs levert kandidaten aan Vlaamse partijen: áls het radicale moslimgroep is, hebben enkele partijen een probleem, HLN, September 20, 2018. Vlaams Belang eist intrekking van erkenning en subsidiëring fundamentalistische Milli Görüsmoskeeën, Vlaams Belang, September 20, 2018. 15 kandidaten Vlaams Belang hebben sympathie voor nazi’s: partij start tuchtonderzoek, HLN, October 2, 2018. A summary of the trial in English can be found here. Turks extremisme op Vlaamse kieslijsten, NVA, October 4, 2018. CD&V zet Lokerse kandidate uit partij nadat N-VA haar ontmaskert als lid van extreemrechtse groepering ‘Grijze Wolven’: “Ze brengt een fascistische groet”, HLN, October 4, 2018. An archived version of the very first article about infiltrations by the Turkish far-right in Belgian politics, dating from October 2002, can be found here.